The online homepage of today's Boston Globe provides a textbook example of bad journalism with its coverage of a proposal to increase the Massachusetts state income tax. 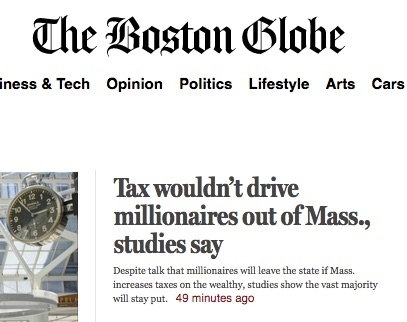 The Boston Globe news homepage campaigns for higher taxes. Ironically, the headline comes over a more thorough, balanced, and nuanced article by Michael Levenson, who from what I can tell is one of the Globe's stronger players these days. It begins with an on-the-record quote from Richard J. Valentine, who says he "might move to Florida rather than pay the new tax." It reports: "New Jersey estimated that 25,000 residents who would have paid $150 million in income taxes per year left the state in the seven years following its tax increase on high earners." Roger M. Marino, the co-founder of EMC Corp., said he may leave if his taxes go up, even though he has lived in Massachusetts his entire life. "As far as I'm concerned, it's a thing to consider — absolutely, seriously consider," said Marino, who is 78 and has an estimated net worth of $1.2 billion. "I have a place down in Florida that looks mighty attractive now." The home page headline language reflects none of that, just an overstated and false claim that looks as if it is designed to cheer on the tax increase: "Tax wouldn't drive millionaires out of Mass., studies say. Despite talk that millionaires will leave the state if Mass. increases tax on the wealthy, studies show the vast majority will stay put." Absent from either the headline or the story is the fact that Globe owner and Boston Red Sox proprietor John Henry for some time resided in zero-income-tax Florida (or on his yacht) while owning two institutions in higher-tax Boston. Or that the Johnson family that controls one of the other big Boston institutions, the Fidelity mutual fund company, moved its family office to zero-tax New Hampshire and also reportedly uses a Florida horse farm as a business address.